The Golden Lotus Square features a lotus flower in full bloom that symbolises the lasting prosperity of Macau. The red granite that makes up the 3 lotus leaf foundation of the lotus signifies Macau’s 3 constituents: the Macau Peninsula, Taipa Island and Coloane Island. 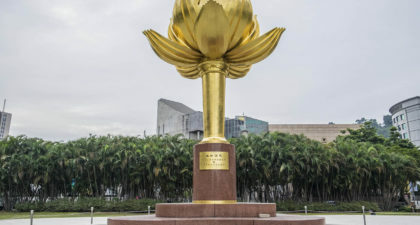 The sculpture was a gift from Beijing memorialising Macau’s handover to the People’s Republic of China with the text, “Lotus Flower In Full Bloom”. Visitors with children should also check out the nearby Grand Prix Museum. The Fisherman’s Wharf is also nearby, although the sights within no longer live up to its golden day and reputation of previous years.